The Rovner Dark assists in producing a full, centered tone. One can compare the results of this ligature with the age-old technology of the string ligature. Enjoyed especially by classical performers for its warm sound, the Rovner Dark is our most favored and top selling ligature. 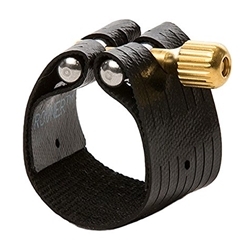 Rovner ligatures hold the reed to the mouthpiece with no pressure points. Because there are no pressure points or rigid constraints on the reed, the reed seats evenly to the facing of the mouthpiece reducing stuffiness and improving tonal clarity.